HR and Transformation teams can use the Digital and Technology skills guide to establish skill requirements and role profiles when shaping their teams. Following the launch of the Digital and Technology skills guide on GOV.UK last week, the response has been tremendous. The skills and learning resources tell us the ‘what’ that is needed. Now we need to think about the ‘how’ to make change happen. One of the first steps is using the skills guide to refresh role profiles and job descriptions. The digital transformation is bringing new, front-end digital roles like User Researcher and Performance Analyst. This is unchartered territory for many organisations and it’s important to quickly establish new role profiles and job descriptions aligned with the required skill sets. Often these roles may have slightly different activities assigned to them, depending on the size of the department or digital team. For example, if a digital team is large and more mature, roles may be more specialised and defined. In this case, a Performance Analyst may focus on typical activities such as interpreting and using performance data to continuously improve services. However, if the team is smaller and more ‘multidisciplinary’, a Performance Analyst may also take on activities related to user research and design. The Digital and Technology Skills guide is divided into 18 skill groups from which many skills can be drawn for a certain role. Using it can create a complete ‘skills profile’ for a role that is tailored for that environment. The skills guide is also available in spreadsheet format which includes a unique code for each skill to make mapping easier. A link to the spreadsheet is provided in the introduction of the skills web page. Skill profiles for existing technology roles, such as Technical Architects and Operations Engineers, are also changing. The impact of disruptive technologies such as cloud computing, big data and open source software, demand new technology skill sets. Guidance on how digital is impacting back-end functions is also included in the guide and can be used to refresh current role profiles. For example, there is a new skill around ‘horizon scanning’ that involves spotting future trends and opportunities in emerging software so technology doesn’t stagnate. By establishing up-to-date skill requirements and role profiles, we are then able to develop the right talent in-house and to recruit the right talent from outside. Skills assessments can be done, skill gaps identified and development plans put in place. 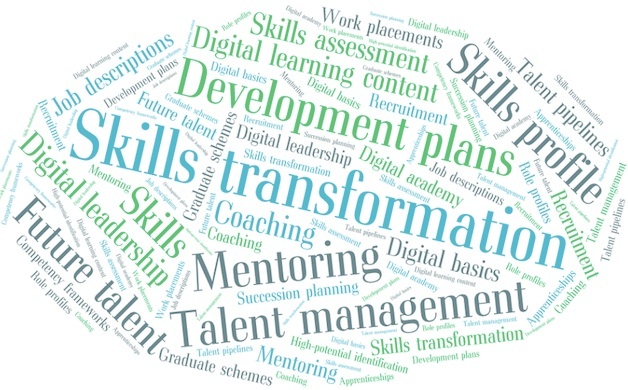 Clearly defined skill sets are key in the journey of a successful digital transformation, and Digital and Technology skills guide is a tool for this.